Abraham Lincoln was originally a member of the Whig Party. 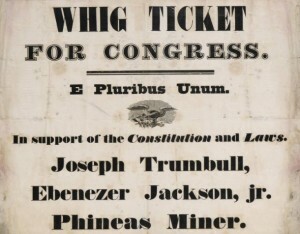 The Whigs saw four members elected President before collapsing and dissolving in 1854. The Whigs were replaced on the national stage by a new party—the Republicans. Yes, political parties can and do die. We may be witnessing the death of one in our time. Which reminds me . . . Here in Texas, powerful thunderstorms can roll through in the late spring and early summer fronted by intense, straight-line winds. Occasionally after such a storm, you’ll see a huge, ancient tree blown over with the roots pulled right up out of the ground. It’s easy to look at the huge girth such a tree and marvel that mere wind could take it down after centuries of life and vitality. But take a closer look and you’ll often see that the roots are diseased and shriveled. Such trees are all showy top and no anchoring base. If the Republican Party rapidly collapses in the aftermath of this election it would not surprise me in the least. And the real cause will have been the disdain for the conservative roots by the bloated establishment elites in Washington and Wall Street; the open borders advocates at the Wall Street Journal and the U.S. Chamber of Commerce. Donald Trump will merely have been the wind that knocked it over. Millard Fillmore was the last Whig president. Perhaps Donald Trump will be the last Republican one.